« Beannachtaí lá Fhéile Pádraig Duit, A Sheáin Léitheoirí! Happy St. Patrick’s Day, dear readers! As I may have mentioned before, I come from a very strong Irish bloodline, and March 17th is a day to celebrate. Tonight we celebrated our Irish heritage a few days early with wonderful friends and delicious food. I was in charge of the soda bread. I found a great recipe in a book I found recently at a book fair. It was a major crowd pleaser and an excellent accompaniment to our corned beef and cabbage! 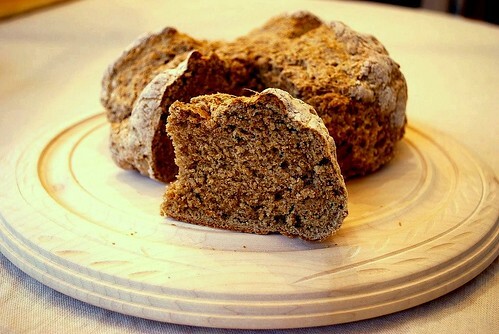 Hearty, dense, and full of wheaty flavor, this bread is as close as you will come to the staple on Irish tables across the green countryside each and every day. 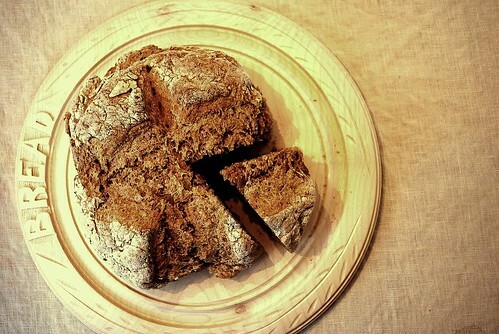 It is a quick-bread, made without yeast. It has a delicate crumb with a wonderfully grainy texture. 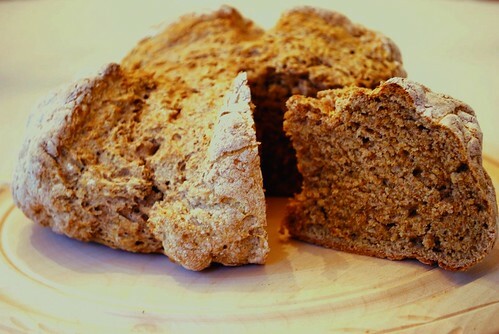 The whole wheat flour gives it a soft nutty flavor. I can’t wait to toast a piece for breakfast tomorrow morning – with a tab of butter and a drizzle of honey, perhaps? Measure all dry ingredients into a large mixing bowl, combining well and making sure that there are no lumps of brown sugar. Pour in the buttermilk and stir with a wooden spoon just until a soft dough forms. Turn the dough out onto a lightly floured surface and knead for about a minute until the dough comes together. Divide the dough in half, and press down on the top of each half to flatten. Place the two loaves on a large ungreased baking sheet – preferably non-stick. Sprinkle the tops of the loaves with a little bit of flour, and, using a sharp knife, mark the shape of a cross on the top of each loaf. Allow the two loaves to rest for at least 10 minutes before baking. Bake on the middle-rack of the oven for about 40-45 minutes, or until the crust is toasty, brown, and crunchy. Cool on racks and serve with Irish butter.